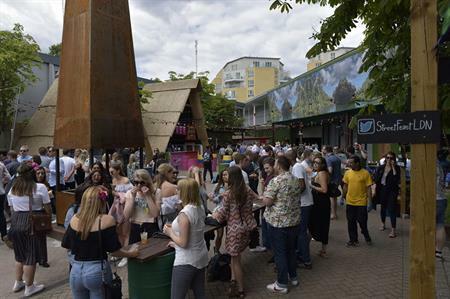 Sky Media held its summer conference at Hawker House in Canada Water for 400 guests. Sky wanted to hold its summer party in a trendy venue, with a large capacity for guests. Streetfeast venue Hawker House in East London was chosen as an alternative to a traditional conference space. The company wanted to impress guests with something quirky and unique, with a range of good food on offer for delegates. Sky Media took over the entire 3,500 capacity venue on 14 July for the event, utilising all of the spaces for various parts of the day. Welcome drinks were held in Hawker House’s outdoor area – a tropical tiki paradise named the Land of Bamboo, with the actual conference taking place in The Big Room, which usually hosts street food traders. The space was transformed with a stage, lighting, screen and theatre style seating. The evening reception was held in Hawker House’s second room ‘The Other Room’, a large space with lots of different bars and areas to discover. Sky booked a selection of street food traders to cook up a feast for lunch and dinner, giving their guests the chance to try dishes from all over the world. For lunch, guests enjoyed Lobster Rolls from B.O.B.’s Lobster, fluffy steamed bao buns from Yun Bun, Thai barbecue from Farang and Brisket Buns from Smokestak. For dinner, the client arranged a trader turnover, with five new traders coming in. Guest feasted on tacos from Breddos, vegan burritos from Club Mexicana, steak and chips at Meat Hook, Venezuelan hot pockets from Petare and to finish, ice-cream from dairy daredevils Chin Chin Labs. Entertainment included a steel band and a fire hoop dancer, tying in with the tiki theme of the Land of Bamboo, which included a makeshift beach built around the venue’s rum bar. Guests also had the opportunity to visit The Braid Bar, before moving on to the Photo Crazy VW Campervan Photo Booth to capture some memories from the day. Sky employees gave extremely positive feedback, with everyone ‘raving’ about the venue. "The Food, the Drink, the staff, the way it was all seamlessly executed, everyone at the venue was an absolute star! We can’t stress enough how much everyone loved it."